Pizzas. They’re the best way to represent fractions, right? Everyone has seen a pizza. Everyone knows you can slice a pizza different ways. 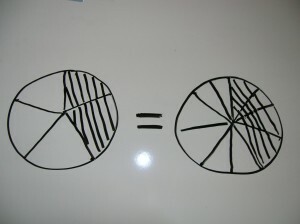 When you need to visually represent fractions, pizzas are the go-to metaphor, right? Well, that’s what I thought until I tried using pizzas to teach equivalent fractions. Sure, it’s easy to use a pizza to represent quarters, sixths, eighths. Thirds aren’t even too bad. But just try dividing a circle into five equal pieces. Or seven. Or ten. Even though I’m a grown-up and a professional math educator, it’s really hard for me to consistently do this. And as for showing visually how two fifths equals four tenths? Unless I do an impossibly immaculate job of dividing those pizzas into pieces, forget about it. 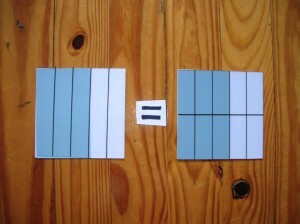 Fortunately, I’ve found a much better way to represent fractions visually: the Math-U-See fraction overlays. If we’re going to use a food metaphor, they’re flat and square, like brownies from a square pan. And like brownies, they are much easier to slice evenly than pizzas. In fact, because they’re reusable transparent overlays, you don’t even have to draw (or slice) anything. You just arrange them on top of each other. Awwww, yeah! Those fractions are DEFINITELY equivalent! You can use the overlays to represent basic fractions with divisors from two through seven, or combine multiple overlays to build other denominators. Not only do they make it really easy to see how equivalent fractions work, but using them is way easier than drawing pizzas and hoping the slices come out even. Now that’s how I want my students to feel about fractions!